Armen-Ontario of AGBU Inc. has proudly awarded scholarships every year to many deserving and qualified students. This has facilitated pursuit of their education and talents in various fields. In addition to other scholarship programs, we are pleased to announce that this year Armen-Ontario of AGBU awarded C$35,900 in scholarships which includes C$13,000.00 to eight local young scholars attending different universities in Ontario. Moreover, Armen-Ontario of AGBU also contributed C$9,700.00 to the Children’s Centres in Armenia. The Children’s Centres ensure that all children have access to after school cultural programs and have the means to develop their talents in performing arts, computers, crafts, dance, gymnastics, language and music. On the evening of November 18th, 2018 at the AGBU Alex Manoogian Cultural Centre’s Library, the scholarship recipients were invited to a reception so that they would be given their scholarships. 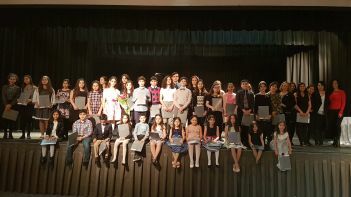 Upon receiving their awards, the students expressed their appreciation to Armen-Ontario of AGBU for their generosity in bestowing them with a grant that will help them with their studies. Dikran Bashmanian, Andranick Darbinian, Jason Farra, Lara Hovagimian, Garny-Verjeen Kafessian, Mane Kara-Yakoubian, Krikor Mouradikian, Nikoghayos Yeganian. Moreover, Armen-Ontario of AGBU has also extended its support this year, as it did during the 2016/2017 scholastic year, to the Toronto Armenian Community including payment in full the tuition for ten children, whose families have fled the Syrian Civil War, so that they may study at the St. Sahag and St. Mesrob Saturday School of Toronto. There they will engage in enriching studies and activities that will enable them to enhance their culture and develop their native tongue. Armen Ontario of AGBU extends their warmest wishes to all these students for continued success in their studies.